“The Grand View Scenic Overlook and Park is a shining example of the passion of this community to protect its most precious resource—the land. ” This was the message from executive director Tom Clay on August 20 as he spoke to a crowd of more than 300 people who were gathered at the Liberty Grove Historic Society property overlooking the Grand View Scenic Overlook and Park in Ellison Bay for the Land Trust’s Annual Gathering. Clay ended by thanking the crowd and conservation partners for working together to complete the recent land acquisitions of 120 acres at Gibraltar Ephraim Swamp and 218 acres on Chambers Island, as well as several other new projects underway. In a final closing message, committee members Rob Watson and Gretchen Schmelzer and more than 60 volunteers were thanked for their contribution to the success of the event. Special thanks was given to the site host Liberty Grove Historic Society, bluegrass musicians from the local band Highland Road, Hinterland Brewery for their contribution of Packerland Pilsner beer, and Main Street Market for the wine selection. 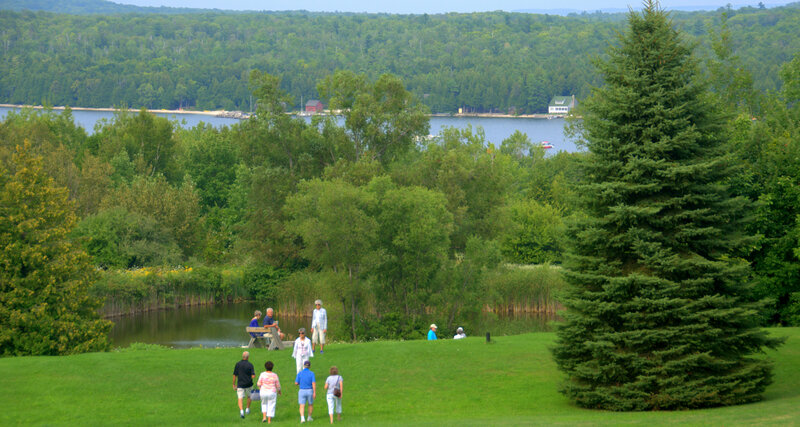 During the event, guests toured the Grand View property, the Liberty Grove Historic Society Museum, and watched artist paint the view en plein air. Artists Liz Maltman, Lynn Gilchrist, Emmett Johns, Rick Risch, Mary White and Mark Zelten donated their artwork to raise funds for the land protection efforts. View a PDF of the press release. Chambers Island Nature Preserve Expands with 50 Newly Protected Acres! for excellence and conservation permanence. The Door County Land Trust is a local, non-profit 501(c)3 organization working to protect Door County’s exceptional lands and waters forever. The Land Trust has protected more than 8,000 acres thanks to contributions of support from members. Door County Land Trust nature preserves are open to the public at no charge for hiking, cross-country skiing, wildlife observation, some forms of hunting, and other low-impact, non-motorized recreational activities.